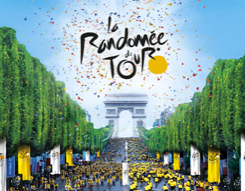 2013 the year of the 100th Tour de France. War - that horrible thing that changes lives. 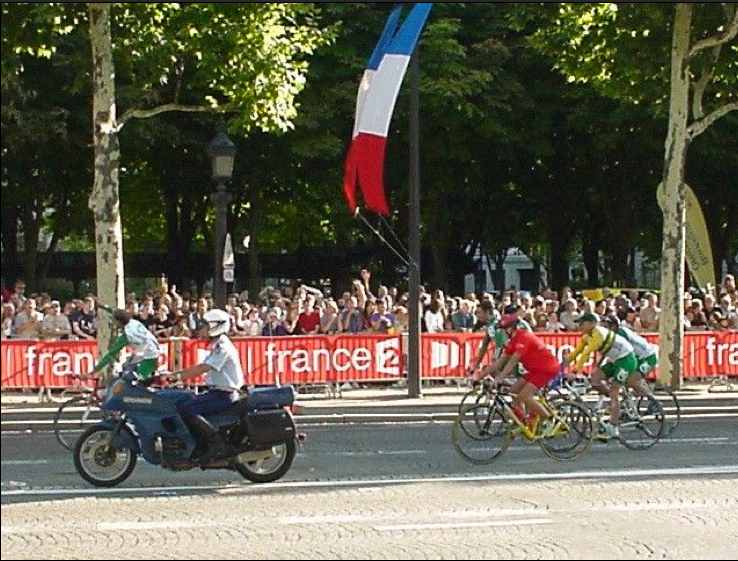 World Wars took 11 years of life from the grandest of the Grand Tours - the Tour de France. Read more about The Missing Years in a post by Pedal Dancer®. 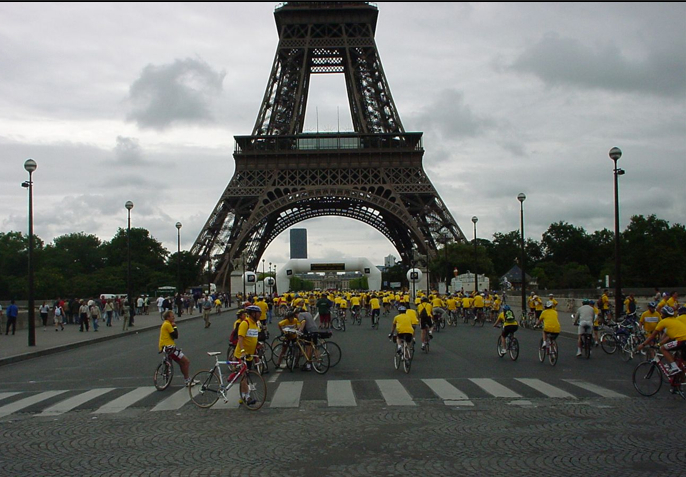 We started the event ride near the Eifel Tower and proceeded along the Louvre and many notable sites of the city. Finally we entered the boulevard of the Champs Élysées and there we could fully feel the famous cobbles below our wheels and look up as the road rose toward the Arc de Triomphe. I felt a rush of pinch me is this real. The mood was light and jovial and I enjoyed the mix of languages, the old and new bikes, and the sea of yellow jerseys surrounding me. 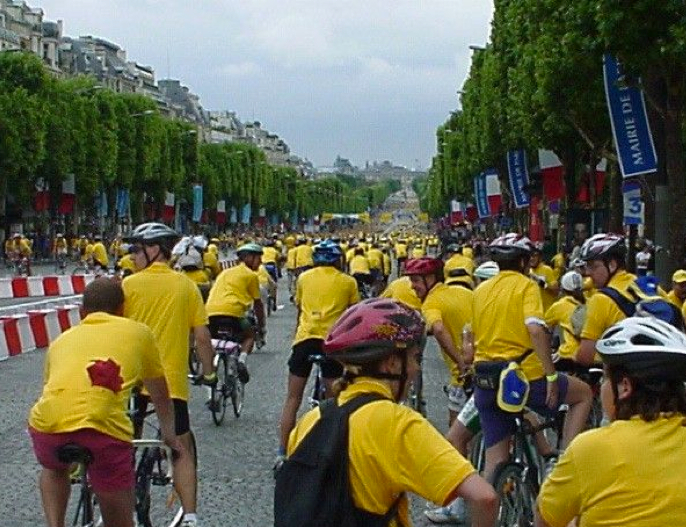 These are the great memories of being a cyclist in France. 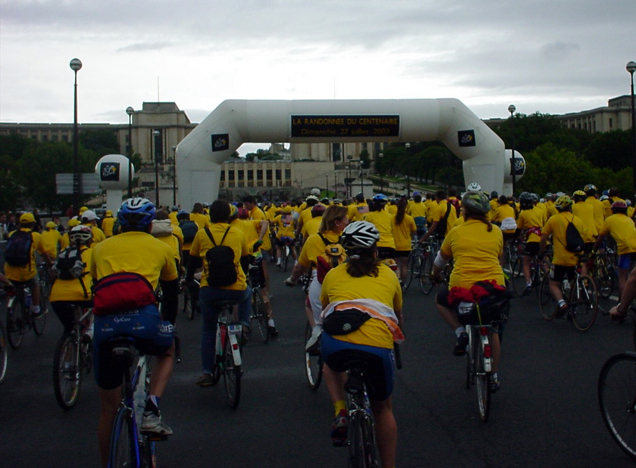 A se of yellow jerseys waiting to proceed across the official start line of La Randonnee du Centenaire. Not a bad place to wait, notice the Eifel Tower to the right. 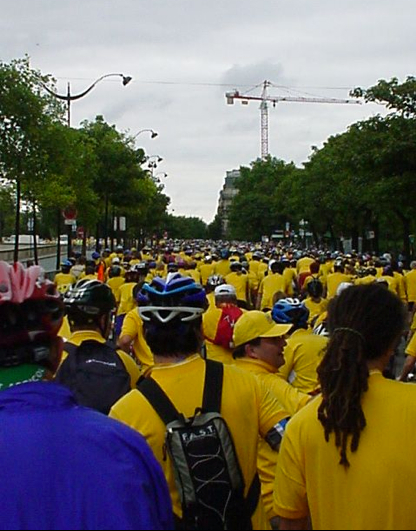 It takes a long time to get thousands of cyclists going. Pedaling through Paris without cars was pretty cool! Although the cobbles were sort of bumpy in Paris for my small pocket camera. 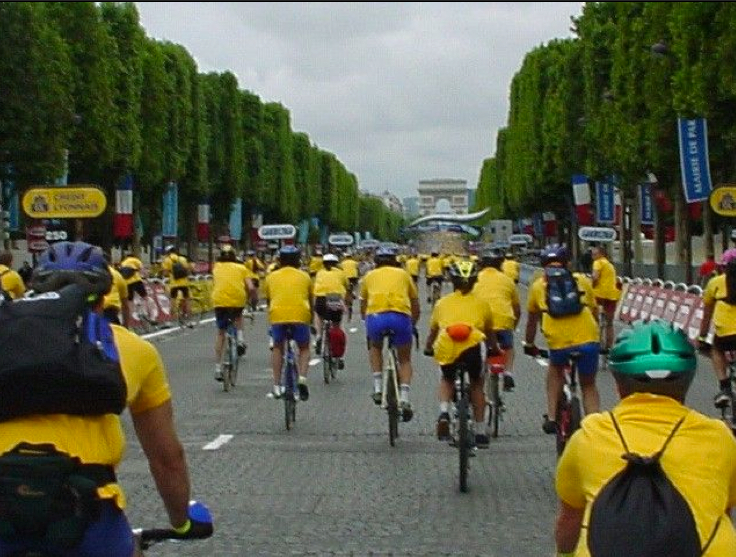 But then, suddenly we had this view ... Arc de Triomphe on the Champs Élysées - on a bike!! 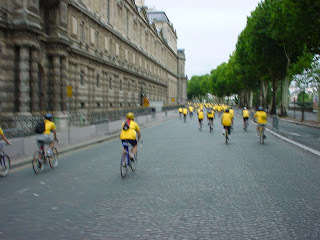 We were riding the cobbles uphill (!) 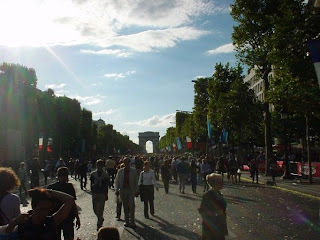 on the Champs Élysées - it was so exciting. I had to pull over to capture the moment. 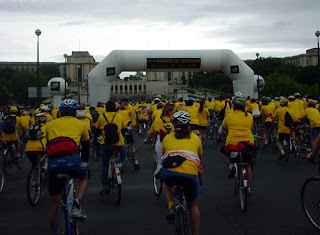 I felt so fortunate to be able to ride in this event. 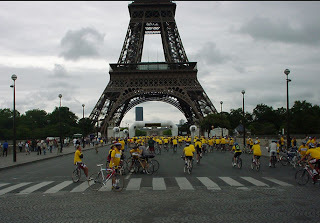 One of the most exciting days I ever had on a bicycle. 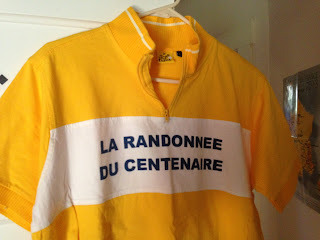 And I got this really cool jersey as a souvenir. Afterwards we had drinks in a cafe in Paris before going out and watching the real pros race the route onto the Champs Élysées. 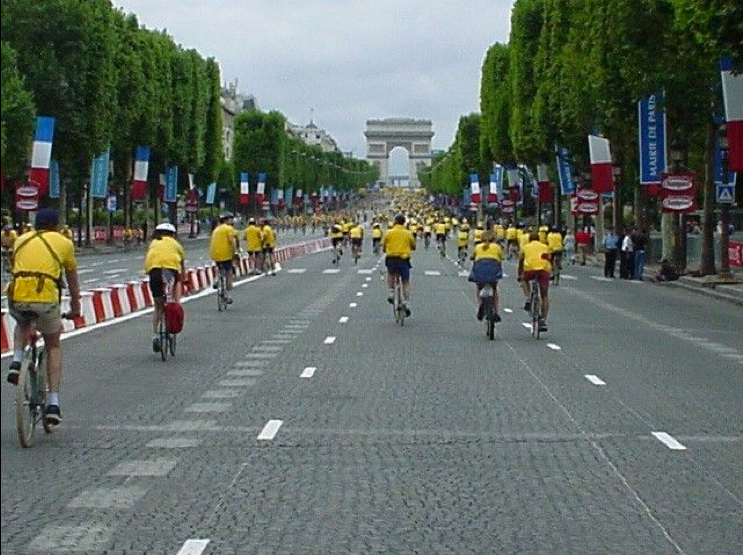 I will forever know what it feels like to ride the cobbles of the Champs Élysées in Paris - it feels awesome !! 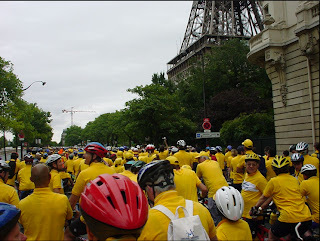 That's me on the right, wearing my yellow Centenaire jersey and Fasso Bortolo cap. Celebrating after 3 weeks of riding in France! 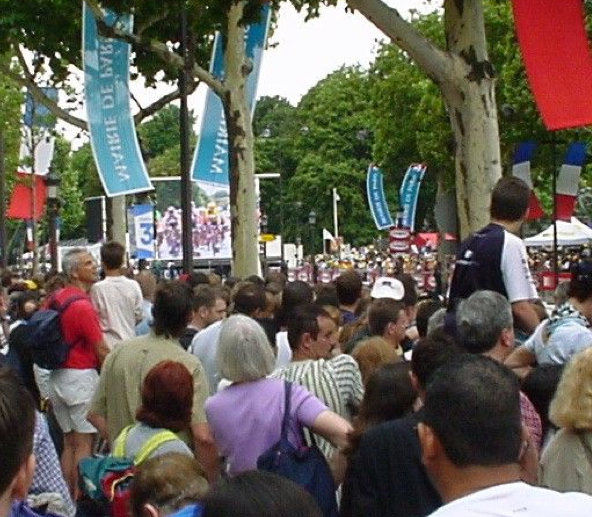 Massive crowds on the Champs Élysées for the 100th year of the Tour de France in 2003. 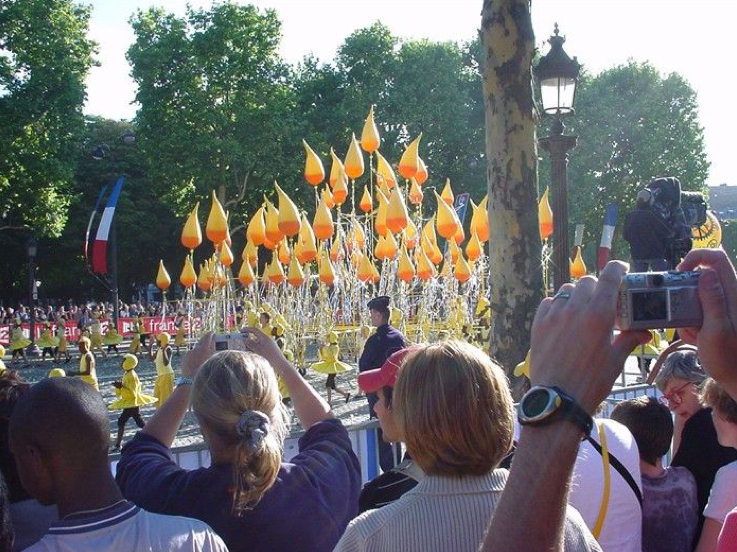 And then the long ceremonial parade began after the race was completed to celebrate 100 years of the TDF. All the previous champions of the Tour paraded by in convertibles. 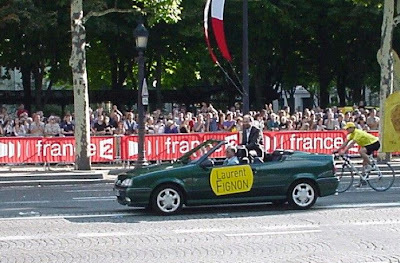 Here is the great Laurent Fignon. Next all the teams paraded by. 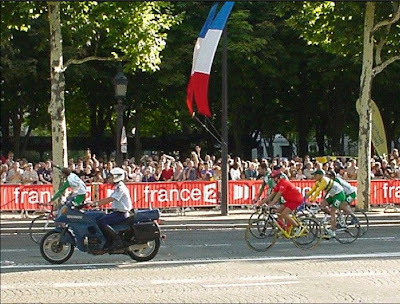 Would you believe that is Stuart O'Grady in 2003 in his Australian National jersey. 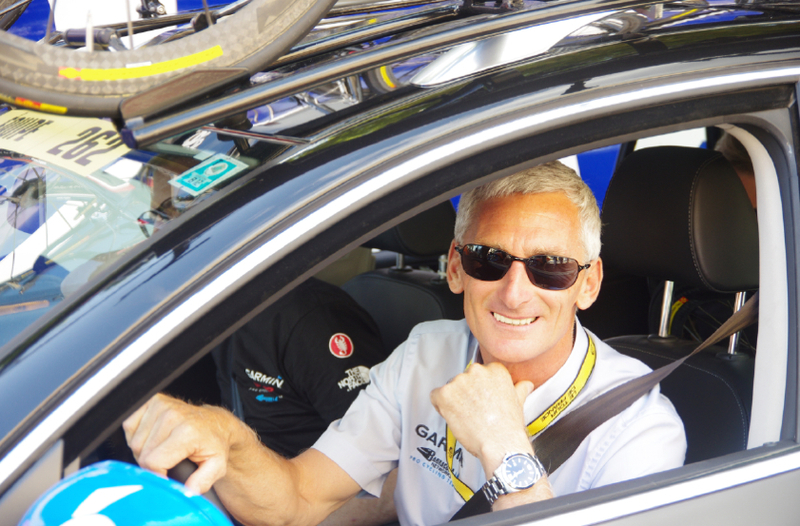 Stuart is now racing in his 17th Tour de France. 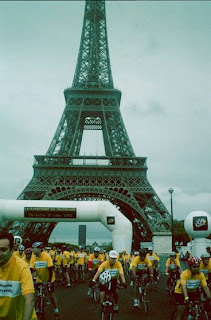 Then a full out parade passed by with music and lots of participants. It was quite the celebration. The fans poured onto the Champs Élysées after the ceremony. 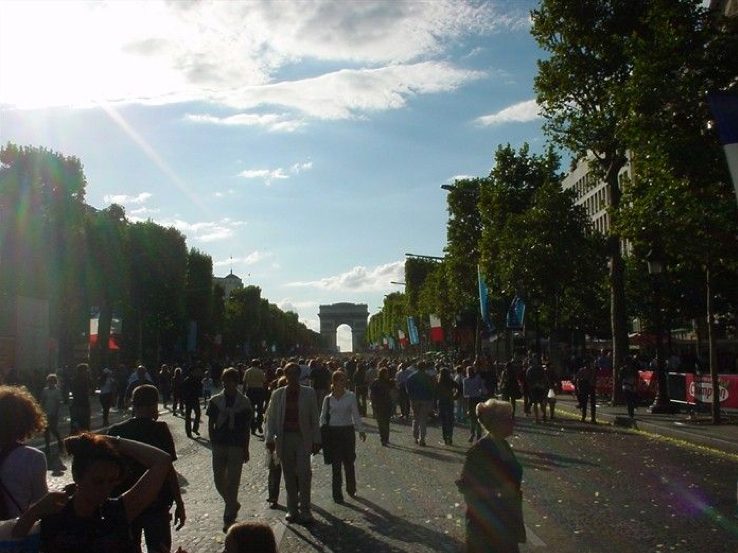 This is one of the rare times every year when citizens can freely walk down the middle of the grand boulevard. 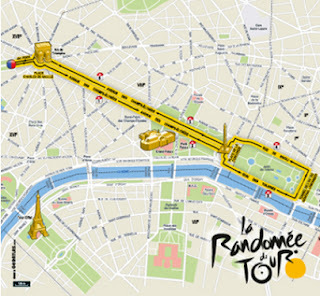 A must do as a fan and tourist in Paris! And that was the end of a fabulous day in Paris in 2003 to celebrate the 100th year of the Tour de France. 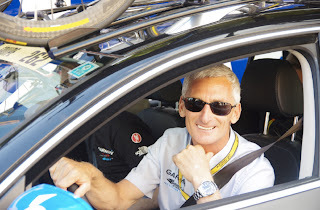 I should say a grateful Thank You to Bikestyle Tours because Lawrie Cranley and his cycling tour company arranged for us to ride in this event. We were asked to complete an entry form by mail from the United States and were given our jerseys upon arrival before the event ride that morning in Paris. 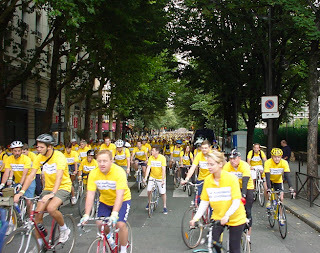 Bikestyle made it possible and it remains one of the most fun events I have participated in to date in Europe besides l'Etape du Tour and a day of VIP at the Tour of Flanders in 2012. 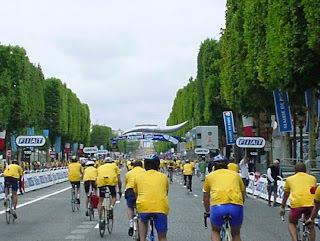 I had ridden 16-days chasing the Tour in 2003. 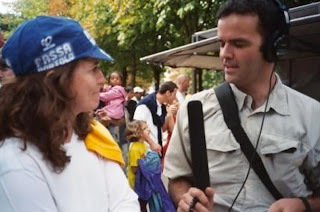 Would you believe our Tour Guides with Bikestyle Tours at the time were none other than Aussies Neil Stephens (currently of team Orica-GreenEDGE) and Allan Peiper (currently of team BMC Racing)! 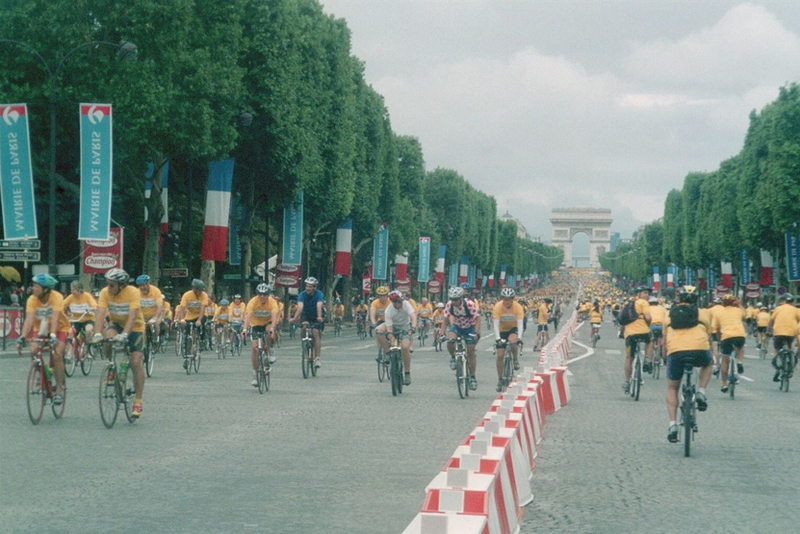 They were "in transition" from riding the Tour to managing riders at the Tour. I didn't ride much with Neil (he took the "strong" group) but I rode lots with Allan. 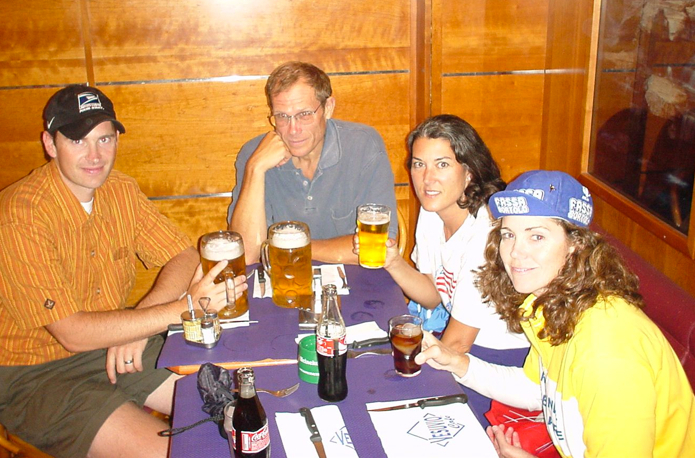 Ah to be young again. Ah the memories! 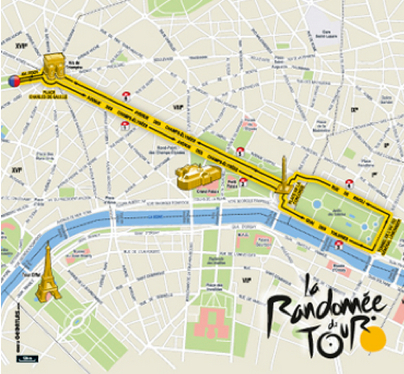 This year for the 100th race of the Tour de France there will be a large parade in Paris to celebrate, there is also a special photographic exhibit and plenty of parties planned and a planned citizen bike ride. 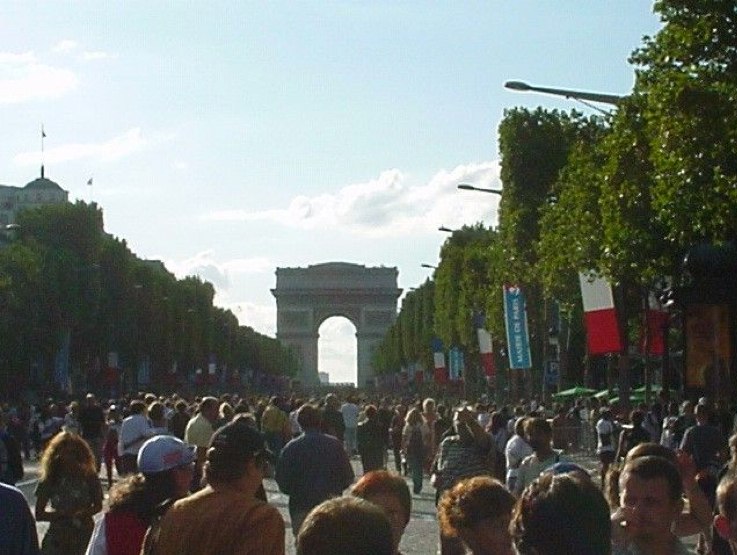 To be there on the Champs Élysées will be fantastic. The 100th Tour de France only happens once. Or maybe twice. Announcement on the official letour.com website: "... the public will be invited to join in the show by taking part in a gran fondo on the final circuit used by the riders several hours later. Thousands of fans, clad in yellow jerseys, are expected to celebrate the Tour and act as forerunners while enjoying a great ride in the streets of Paris." 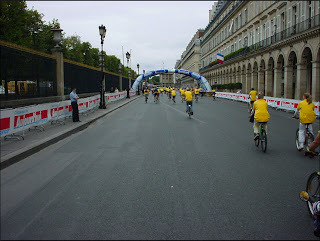 I'm in Paris (tips for viewing the final stage), Ah Paris! , Final Stage of the Tour de France (at the Tour de France in Paris in 2010. 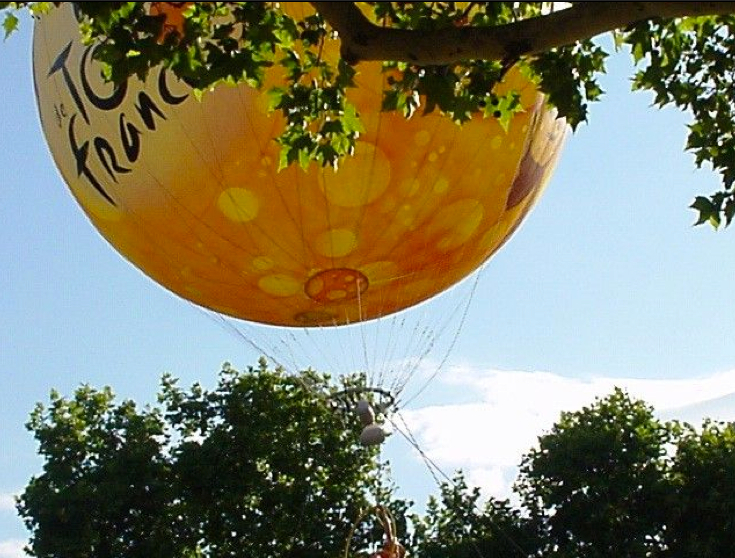 And The Missing Years about the race preceding and following the war years.